I grew up whishing on a star. It seems like I'm updating my blog so much currently, right ? I have to say that I'm kind of proud of myself because I'm getting more & more organized day by day, so I can do everything that needs to be done apart from my school homeworks. I've decided to write more english articles because I guess everybody can understand my articles that way, & also because it takes me more time to write in french & then translate in english. Hope my french readers won't mind too much ; I'll still do french articles when I'll have enough time like during week-ends n_n. So this is my outfit of the day, a vintage skirt from my Mum, a top in white lace mummy bought me during the last sales & my favourite boots without heels, so comfy for everyday life & especially for school when I have long days. Tomorrow I'll go to the swimming pool with Emma, it won't be useless to do a bit of sport since I've decided to exercise a little bit every day, I really want a better way of life. I'm already trying to avoid industrial food & so on, actually I've never really eaten that sort of food because my Mum always cook & I kind of totally dislike junk-food like fast-foods (I've never ever eaten in a fast food in my whole life, & I don't miss it at all). Plus, it feels so good to make sports, it may be hard & tiring but in the end it's always beneficial ! Nothing else to add, just wanted to say a few words to give you some news ;'). My week-end's already overbooked .. A Philosophy paper to write, History lessons to learn for a test, various homeworks, books that need to be read & a lot of others things. I hope every single one of you is okay, thank you so much for the visits, the comments, the amazing mails I receive & so on ! Don't forget to look around you & notice all the little beautiful things ♥. 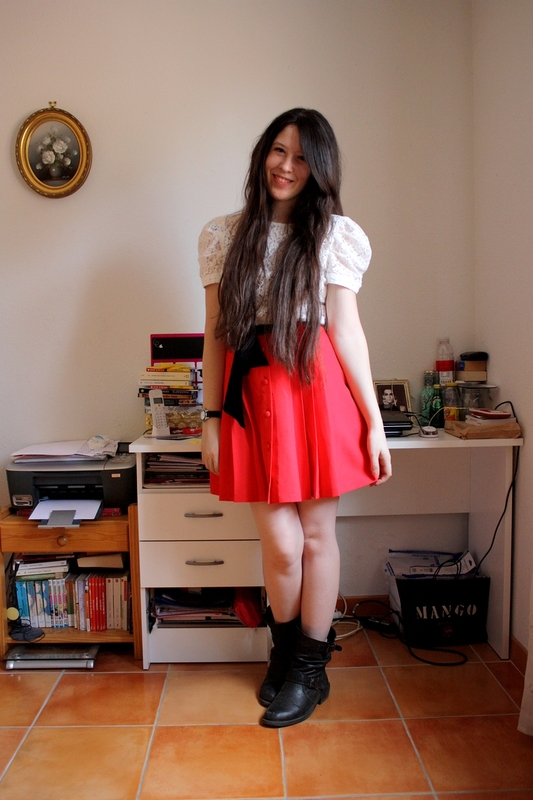 Skirt : vintage, top : Promod, boots : Mim, belt : Naf-Naf ribbon. 28 comments on "I grew up whishing on a star." Merci Audrey ! Super mimi ta tenue & tes cheveux sont magnifiques *_* !!! You're sooo beautiful & i loveeeeee your hair, like wow! please check out my new post maybe? I'm so excited to have found your blog, it's so pretty! Love the easiness and chic it has! your outfit is so cute :) and i love your boots! good luck with all the work this weekend! Ta jupe est superbe ! Le rouge te va bien ! hé ben merci beaucoup =) ça me fais super plaisir ! Interestng connect, soft skirt and lace tee + heavy shoes! Great blog! What about following each other ? aww cute look! love your lace top, its so romantic, and i love the color of your skirt! ps. please join my giveaway! Thanks to everybody for the amazingly nice comments ! <3. Quelle chevelure ! 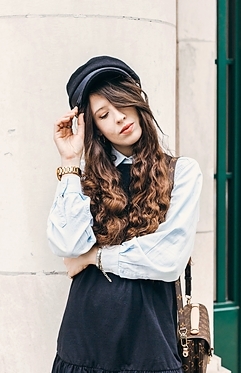 J'adore ce haut! Oh mon dieu,!! Tes cheveux me rendent verte de jalousie,! Haha,!